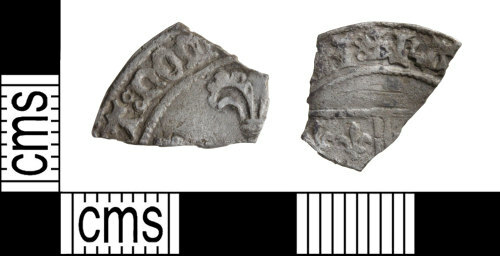 A fragment of a silver post-medieval French coin, possibly a 4 sols piece, dating to the period AD 1643-1715. Only a portion of the fleur-de-lys on the obverse survives, and on the reverse a small fragment of the fleur-de-lys on a shield. Obverse description: Part of a fleur-de-lys. Reverse description: Portion of a shield with fleur-de-lys in the top left hand corner.